Home » Giveaways » WEEKLY GIVEAWAY! 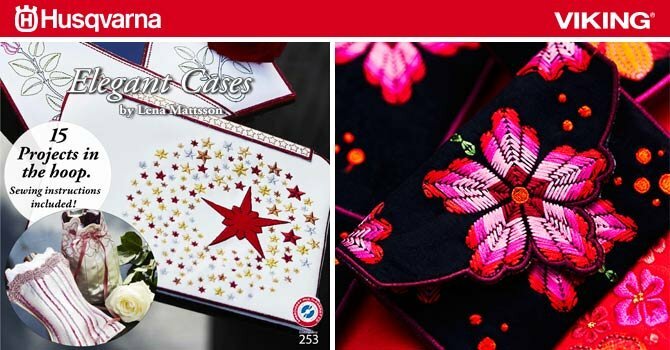 Elegant Cases Embroidery Designs! Enter now for your chance to win Elegant Cases Embroidery Designs, sponsored by Husqvarna Viking! Here you’ll find smartphone and tablet cases and many more beautiful in the hoop projects. Contest ends Sunday June 21st at 5PM. Get your entries in now! Congratulations to Vicki H…winner of the QUILTsocial DYLON® Fabric Care Collection Giveaway sponsored by H.A. Kidd and Company Limited! I really like the cases. Very nice. Agree with the 9 good sewing habits.My mother taught me always sew PRESS never be lazy & miss the pressing. I like everything that they show and write about. Love the cases! Thanks for offering the give away! Something I should do more of, but it is on the machine itself, been there many times. I love in the hoop projects. Love the cases. Thank you for the chance. Lovely design set, perfect for summer stitching.